There is so much ‘rush’ in the world today almost to the point of being overwhelmed as to where to rush next or which rushing to follow. Not say on the surface that all ‘rush’ is in so way negative; rushing to stop pipelines, rushing to boycott this and that, rushing to get the best comment on social media – rushing keeps us from our hearts and fixes us solidly in the most childish part of our being, our heads. Childish is that need to be part of, that needs to be loved, which needs to ‘fix’ some historic wound. Our hearts on the other hand is far more childlike and being childlike takes time and care of each moment. Our Hearts are definite ‘go slow’ machines. There is a story in the Sagh’ic Tradition, which tells of a great warrior that comes war weary to the Bear who guards the pathway to the land of the dead. He tells her of his battles and all the mighty quests of his life. She is impressed, yet asks of love and what it means. The great warrior can only speak of duty and rushing. She sends him back telling him to go and find love. In this story the hero returns to his true love who he neglected for the great causes he fought for. She is an old woman on her deathbed. In that last kiss she takes him to her path to the bear, which leads across the mires of Bruail, muddy and messy. He looks at the path he took around the mire, harder, quicker and more focused, walking through the mud would be slow and he might get stuck. Yet she sees children enjoying the simplicity of the mud. It is at this moment the warrior knows he must become innocent to walk to the bear. When we consider all the rush and struggle always to be one step ahead, have the next device, the next car, the next best thing, and then we know we have lost innocence and intimate relationship with the world around us. This Blood Moon prophesy, or whatever we might call it, is actually a call for innocence, we are being given a choice to go back before we are sent back to live childlike lives. Ceremony is an active choice to engage in the simple; an act of responsibility, an act of intimacy, an act of awareness and an act of spiritual relationship. The childlike awareness required is to make ceremony of all we do; it might be driving that car and using that gas, which in turn is getting the oil companies to provide that gas, which means it has to be transported in some risky way to the environment to us. When ceremony is applied, it all changes, we become part of the entire story and then and only then do we know what we must do to change the story from our part in it; it will be much slower and far messier. Ceremony slows us down, brings us to childlike awareness and wonder, and opens a path to innocence. 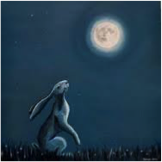 In another Sagh’ic story, Cearr the Hare goes to dance on the moon. 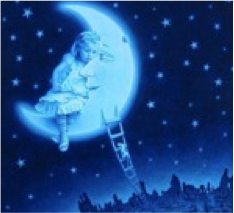 He is called back to be a warrior for innocence so that all can dance on the moon. Seems we all have to help/teach each other play in the mud and as Ceann-Iuíl we are being sent back time and time again to do this to bring our tribe back to this innocence. I would like to think that we are approaching a time when we will be confronted by the terrifying, as terrifying as we have made it; ‘it’ reflecting our own fears born out of lives and living we thought was what was expected. And that ‘terrifying’ will be as understanding as the Great Bear, who will shake and roar and yet send us back again to try again. In order to reclaim innocence we are sent backwards through all that marred that innocence; if hell were to exist it would be watching all that we took no responsibility for, all that we did not do that we could have, all that we did that was better not done and know that we were powerless to change all those outcomes. There is a telling of having blood on ones hands as a sign of self-questioning, “What have I done?” No matter how many times you wash those hands, the blood comes back; only being able to wash those hands in the waters of innocence when we can acknowledge the reason for the blood. The warrior is sent back to wash himself and be innocent again; that washing is to confront what he did not do. As The Blood Moon approaches, we prepare ourselves to be innocent, every ancestral spirit waiting with oceans of water to wash us. And yet I do not think this will be a deluge of innocence, it will be drop by drop, each drop of water searing away each drop of blood. The Forgiveness ceremony asks us to let a few drops of water fall from our hands as rain acknowledging our commitment of intimacy with the world. This water that drops will be a moment to moment awareness of that intimate relationship and our honest place within it; if I drink this coffee from this paper cup, I drink from what was once a living tree, coffee that may have come from unfair treatment of others, heated by power maybe generated by oil (certainly the cup was made from machines powered by that oil) with cream that may have come from a badly treated animal and that each element in that connective relationship is the same spirit that I am. And with this coffee I eat this chocolate cookie, whose chocolate comes from the slavery of children and the misuse of chemicals to produce the wheat and sugar; coffee, sugar, chocolate that came on planes and ships that used vast quantities of oil, that the oil companies (with all the pipelines and oil spills) provide so I can have that coffee and cookie. The ceremony of life is being aware of each drop of water and each drop of blood in order that we can begin to take that journey of innocence again. To dance on the Moon is to be one with everything. Can we dance on the moon knowing it floats in a sea of blood? Change is the act of making or becoming different. Change is one of the few true constants of Life. If we are alive, we are in a continual process of change. Change is not always uncomfortable. Often, we do not wish to see that everything changes constantly. It is common enough for us two-legged ones to encounter change, or the need for change, and step back, stand back. But one hopes this is a temporary moment – and does not become a stance. When human beings adopt a stance, it can be tough to move from it – even when it is essential to do so. Our current human flow of current events in the world owes much to our having adopted a stance – and welcoming no question of moving from it. It also seems our current human flow of events has much to do with standing too far back – and staying too far back from what needs intimacy and closeness. In the Sagh’ic Tradition’s story of Iolair – the great Eagle, his massive wing thrusts were so strong that the Ancestors cried ‘Stand back! !” Four times this happens, and his wing blasts thus create the four Great Winds. But he remains in that place of ‘Stand back!’ from that point onwards. The Ancestors cried out for the needs of one moment – not to create a permanent place of distance. So far back stays Iolair, that he does not even think to eat – entranced by the beauty of what is seen from a distance. 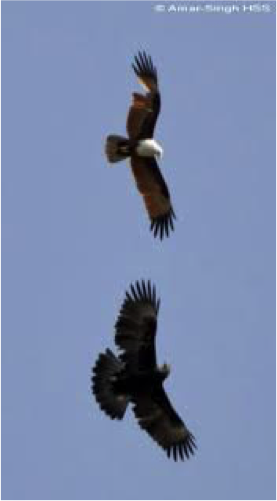 Seabhac – the Hawk – is also able to soar to great heights also – but his vision is focussed on both the great and the small. There is a lesson for us in this. 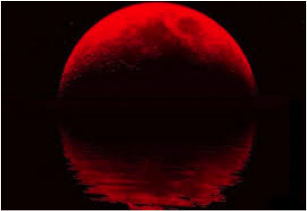 The Blood Moons and the Last Song speak of great changes…but also of great possibility for us to change…and perhaps remind us that although we are small on our own, and can at times create only the smallest changes ourselves – we are many if we come closer to one another. And many small changes can create massive change. For this, we need to soar on the gift of the One Breath with the wisdom and practicality of Seabhac…not so much distance as Iolair. This is a time to invoke the might and focus of hawk with us in our seeing, in our dancing close, in our doing what truly needs doing in the world – in the world right outside our door, in the people we encounter. This is the time to encounter the world up close, and be the moment of change, the moment of possibility…that each one of us is meant to be. And perhaps being this moment of change we are each meant to be is not so complicated …perhaps it is simple – as simple as breathing. One of the only other constants in Life…is the flow of the breath while we are here. If we are breathing, we are alive. If we are breathing, we are in a process of change. We breathe 23,040 times every day that we are alive. 23,040 moments where change is happening. Twenty three thousand instances where we can change one small thing. Perhaps the breath is the key…almost twelve thousand daily moments of receiving the Breath. Almost twelve thousand moments of releasing, of giving the Breath. Our ability to embrace change, to create change, to manifest change…is not in our heads, and all of the words and plans and struggles and stresses that reside there. Our ability to be change is not in language. A simple moment or two of attention to what is really happening…might be the moment of change the Song around us has been waiting for. In the moment that takes our breath away, everything changes as a result. And to have our breath taken away, to be truly moved by something…means coming in close, not standing back.